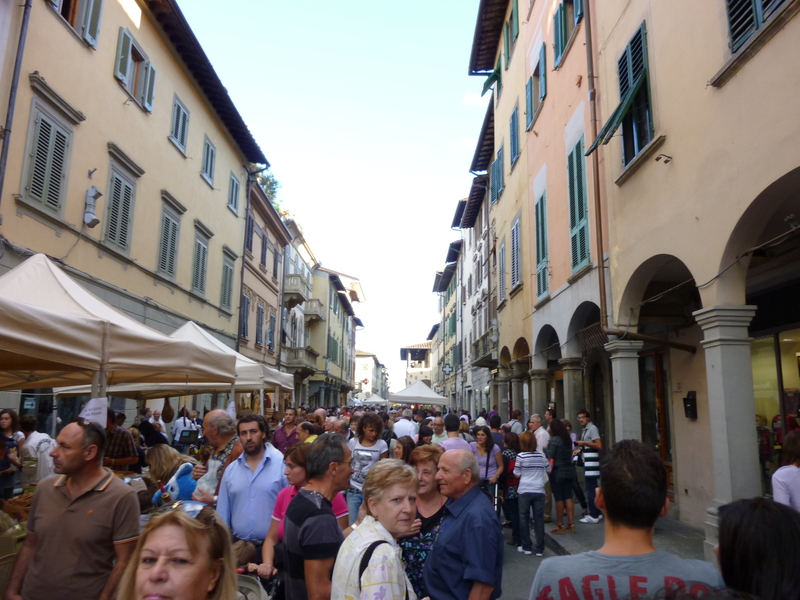 I need to tell you about the place we are staying, San Giovanni Valdarno, and the nearby town of Arezzo, which we visited on Sunday. The train from San Giovanni Valdarno to Arezzo is just a 30 minute ride east, and we have to walk through town to get to the station. Since there was a ‘Feste’ on in our little town we made ‘un passiegato’ past all the food and wine stalls. 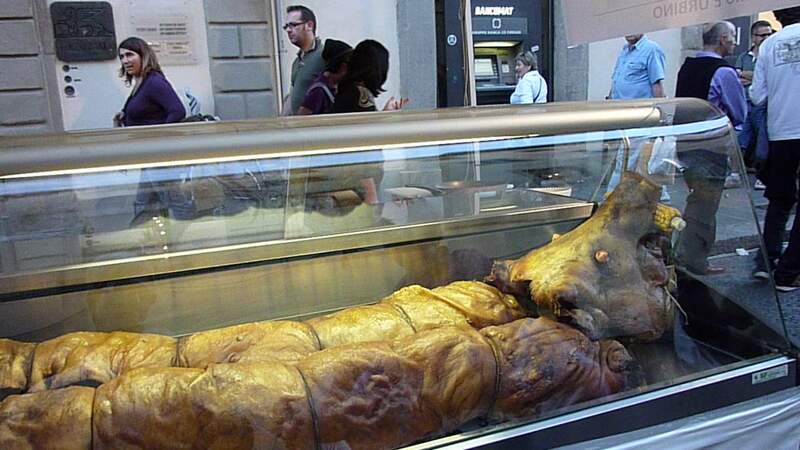 A favourite food of ours from previous excursions to Italy in the Pannini Porchetta. Vegetarian Alert!! Delicious slices of roast pork on the perfect crusty roll or sliced bread, with a bit of the ‘crosta’, or the crusty crackling. Cooked ‘al forno’ in a wood over with only salt and pepper for seasoning. Sometimes the simplest things give the most pleasure. The normally quiet streets were transformed for the duration of the Feste (somehow loosely linked to a religious feast of pardon for our sins). We finally made our way to the station after many tasty diversions and encounters with classmates and teachers from Il Sillabo, our language school. The trip to Arrezo, though short, takes you through the Arno Valley and via farms and vineyards. The region produces a great many items made by master crafts-folk; wines, cheeses, small-goods, pastas, breads, etc. We see the word ‘artigianato’ often and this indicates a product made by the hand of a master. 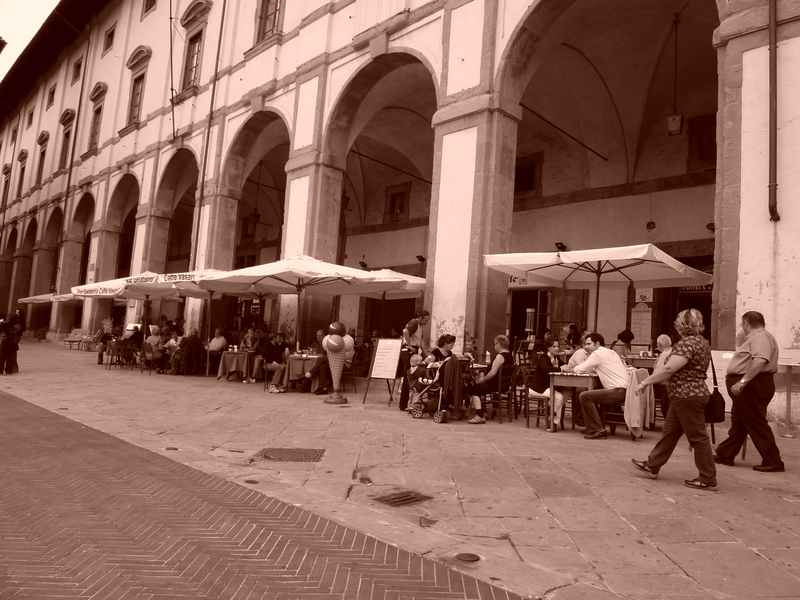 Despite bombing during World War II, we found that Arezzo had all of the charm of more famous villages and hill towns (think Siena, Montepulciano, San Gimignano) and less of the tourists. 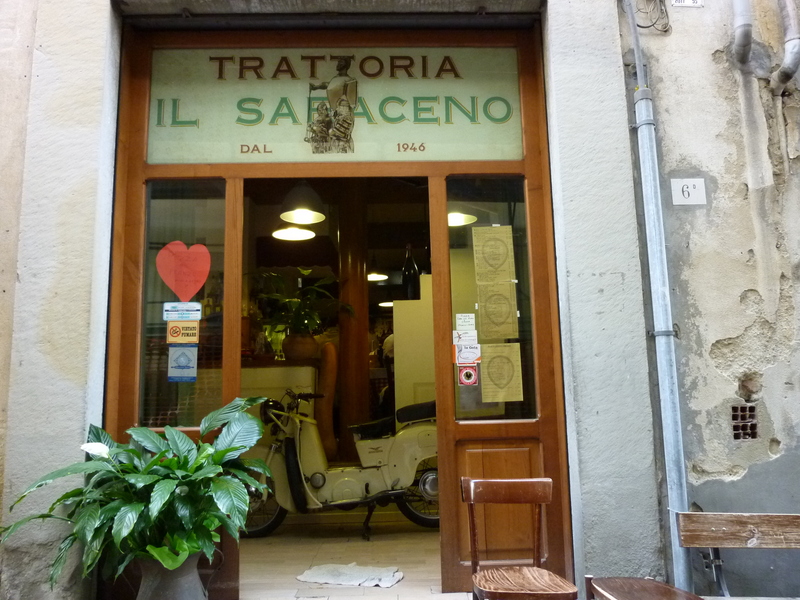 It is a stylish town and the citizens fill the cafes and trattorias. There are numerous churches in Arezzo and the 14th century church, Chiesa di San Francesco, contains Piero della Francesca’s fresco cycle of the Legend of the True Cross (1452-66). These beautifully coloured masterpieces cannot be photographed. There is also an Archaeological museum and a Roman Amphitheatre just at the beginning of the town near the station, but we just ran out of time. Forse, un altro volta! It sounds like you are having fun already.